I think that it is pretty cool that these two little puppies will share a birthday with the new wee Prince. I had a request for pictures so the "pup-perazzi" hung around the whelping box and got some cute pictures. Lady Eclat and Prince Dapper delivered up the Duke and Duchess of Brighthope this morning and they really would love to share a birthday with royalty so here's hoping that the new baby across the pond is born today. It would certainly make for some interesting puppy names!! Sorry all the press is elsewhere so no pictures yet. I am not going to complain, only to say that the Brighthope gang is all inside, fans and the air conditioner are our best friends right now. A chance to sit at the computer for a bit and catch up. 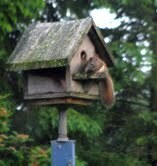 Here is another "furry friend" that lives at Brighthope. Brighthope sends a great big Birthday Wish to this wonderful country we call home. And what better way to celebrate a birthday then with family. Children (we have 4) and grandchildren (we have 11) are a very special blessing. Nana and Papa are extremely proud of our family and we just wanted to share with you today.